Get your kids to listen better. Stay calm in the heat of the moment. Be the parent you know you can be. Hundreds of families have found success using these methods to handle defiance without the use of punishment. Learn how to foster kindness and diminish conflict with tips from a family therapist. Teach your child how to behave in healthy ways when feelings are strong using techniques by Dr. John Gottman. Identify triggers and learn calming techniques. Learn tips from professionals in the field of family therapy and education. Develop a greater understanding of your child's behavior and how to address it. Happy Family Summer- How to have the best summer with your kids! 1. How does the bundle work? How do I get access to all of the resources? Once you have paid for The Positive Parenting Ebundle, you can click on the hyperlink "The Positive Parenting Bundle" on the confirmation page. You will also be sent a confirmation email from which you can access the PDF file. Download the PDF. Within the file, there are links to every resource in the bundle. Some are self-paced online courses, some are ebooks, others are activities and printables. Click on the title you want to start with to download or access the resources. 2. How is the value determined? Each of the products included in the bundle can be purchased separately for a total price of $377 USD. For your convenience and for the purpose of the sale, we have assembled these resources and are selling them from February, 18th - February 22nd, 2019 at a discount of over 90%. 3. Can’t I just google all of this? Simply put, no. You most certainly can google information about positive parenting and get many valuable resources. This bundle has the convenience all of the information in one place as well as access to content you cannot get anywhere else. Print off and enjoy bonus materials. 4. Does the content expire? The ability to purchase The Positive Parenting Bundle will expire on February 22nd, 2019. Access to the resources is guaranteed for one year. Anything you download you will have forever. We recommend backing up your content on a separate drive. 5. How can I write notes and highlight what I read with an electronic product? Some electronic applications allow for highlighting PDFs, here is a resource on how to do it. In some of the ebooks, there are pages meant for note taking and customization. Those books contain instructions on how to print just those pages. You also have the option to have it printed at home, work, or at a printing depot. 6. What is the return policy? We offer a 100% money back guarantee up until 11:59pm EST March 22nd, 2019. After that, there will be no refunds. 7. Can I share it with others? We would absolutely love that you share The Positive Parenting Bundle website with your friends, family and colleagues. The printable activities are intended for repeated use. However, the distribution of any of these products without explicit permission of the authors is strictly forbidden. 8. 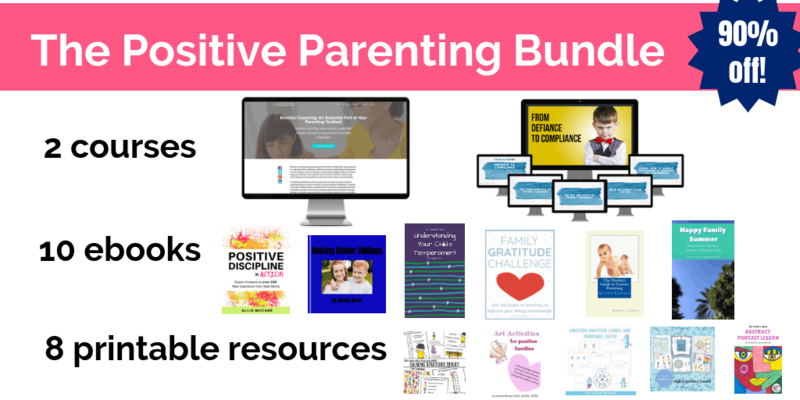 What age ranges and topics does The Positive Parenting Bundle cover? The Positive Parenting Bundle covers topics on toddlers to tweens. 9. What if it doesn’t apply to my child(ren)? These resources are largely rooted in developmental psychology and have mostly been based on the results of replicated research involving large sample studies. That is to say, the majority of the time, when applied these principles have been shown to work repeatedly and get the best results from your children. That said, there is no guarantee that absolutely every technique will work for every parent and child all the time. 10. Is it just a bunch of research jargon or is it easy to understand and apply? While the vast majority of the techniques are based on research extensive research, the courses, books, and printables have been created for everyday parents. The wording is accessible and meant to be easy to go through. 11. Is there a way I can benefit from this without having to sit down a read through pages and pages of content? I’m busy. Absolutely. Most of the content does require reading. However, there are videos of parenting insights available for you to watch.